This past weekend here in Houston, TX we were visited by a little taste of fall. It slipped in on Friday and by Monday morning our forecast was best described as seasonably warm. I’m more of a warmer weathered person myself but I have to admit that I was ready for the drop in temperatures just like the rest of Houston. Maybe because the weather was going to be nice or maybe because it was going to be my dad’s birthday weekend, I decided on two very fall like things to do last weekend. I joined my dad and Lety on a hiking adventure at Brazos Bend State Park for a “Night Hike”. The hike was described as a “walk in the park after dark to look and listen for things that go bump, screech, howl and squeal in the night” they also included folklore, legend and myth. It ended up being a pretty awesome experience, they had a few stops along the way and talked to us about myths and legends like “La Chusa” and they debunked the idea that bats are blind, plus how they help out by eating all those pesky mosquitoes we all love around here. In between we were able to catch a beautiful October sunset and we glimpsed a few alligators along the way. They even told a tale about a “Captain Gaucho” who haunts the lakes at night! It was a little silly but the mood was right and few alligators were hanging out listening to the story with the rest of us. The alligator sightings were our favorite part of our hike, we definitely kept on the trail after dark because we kept joking around about the possibilities of a 9 foot gator lurking around close by! Earlier in the day I decided to make a big ole’ batch of Chili for my dad, I figured it would be the perfect way to top off a beautiful fall evening and it was! 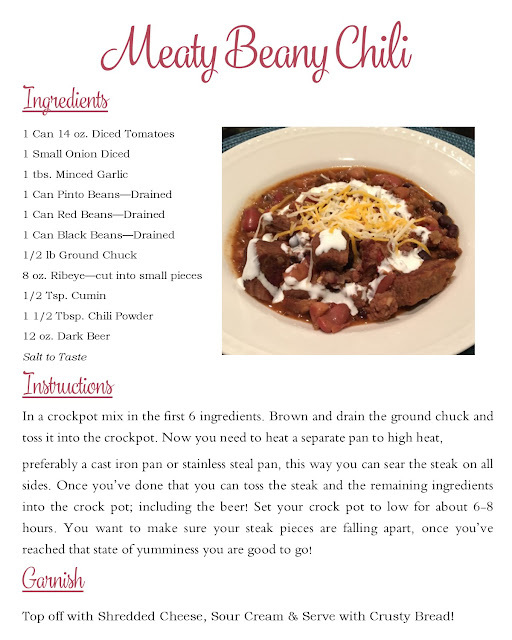 It might not be your traditional type of Chili but maybe when fall really comes to Houston you might be in the mood for something warm and hearty, so I thought I would share my recipe with you. Are you ready for fall and all the yummy food that comes with this time of year? I know I am, okay so I’m never ready for colder weather but I’m always ready for some yummy grub!